Sometimes a cake doesn’t have to be shaped like a pirate or dragon to be incredible. Sometimes a cake can just be a yummy layer cake with plain white frosting that you make for a friend. This cake may look like an ordinary white cake on the outside, but when you make the first slice you soon realize that it’s in fact the zaniest cake you’ve ever seen. Made with 6 rainbow layers this cake may be the only one we’ve ever seen that’s more beautiful after you cut into it. 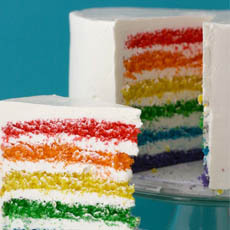 The recipe is available at Whisk Kid so you can make your own Super Epic Rainbow Cake!